In accordance, Valentine's Day this year, which falls on Monday, February 14, and coincides with the Prophet's birthday, has been declared a dry night according to circulars sent from the Dubai Department of Tourism and Commerce and the Abu Dhabi Tourism Authority to hotels across the country. From sundown on Monday until sundown on Tuesday, no alcohol will be served. The suntan is still free. Karl Whelan at Irish Economy -- On Monday, January 31st, Anglo Irish Bank are going to pay out on a maturing bond worth €750 million. (For reference, the total cut in this year’s welfare budget will be €873 million.) 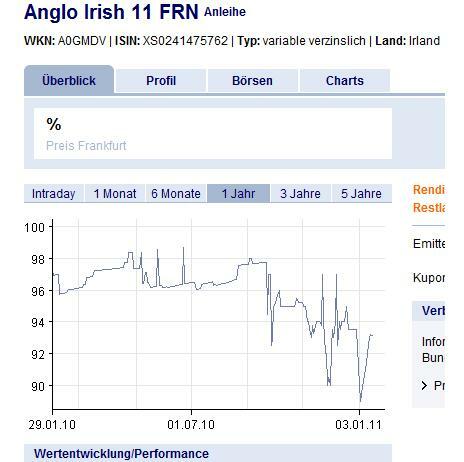 The investors who purchased this bond invested their money with Anglo on the 17th of January 2006. The bond is senior unsecured debt and is not covered by a state guarantee. 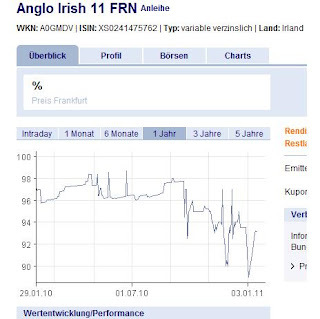 With some tedious trawling through German financial information websites (apparently reflecting that many holders of this bond are German), we've gotten a price chart for the bond. It appears that even quite recently, and at various times over the life of this bond, holders expected sizable losses on it (in the range of 10-15 percent of principal). As Karl indicates, it's a tad insane to be paying out on bonds in an insolvent bank. And so its an additional level of puzzlement to pay out in full on such a bond when even the beloved "markets" don't expect that. At the remove of a brief interlude, we can now unequivocally admit that the forces of Arab autocracy have turned back the challenge to their dominion. True, they had been unable to overthrow this chaotic new democracy in Iraq. The Arab brigades had not converged on Baghdad, from Saudi Arabia, Jordan, Egypt and Syria. American power had provided a shield for this new Iraqi order. And the Iraqis were to develop a surprising attachment to this new experiment with liberty. There was blood in the streets, and there was chaos, but the Iraqis were to discover deep within them a taste for elections, and for a political life beyond despotic rule. For their part, the Arab autocrats nearby had waited out the appeal of Iraq’s liberty. They had proven effective, it has to be granted them, at frightening their own populations with the violence that was playing out in Iraq. In the oddest of twists, the triumph of the Democratic Party, and its standard-bearer Barack Obama, was a boon for the Arab autocracies. No sooner had he come to power had President Obama sent forth the word that his predecessor’s diplomacy of freedom would be abandoned. Can we say safely at this point that promoting freedom in the Arab world might be less to do with invasions and Churchillian appeals to freedom, and more about shutting the f*** up while actual Arab people come up with their own mode of unlocking their sclerotic countries? Incidentally, Ajami's article displays a syndrome common to conservative critiques of Obama's Lebanon policy, namely that it ignores the debilitating effects on the country's politics of the Israeli invasion of 2006. Financial crisis: was the cure the disease? The US Financial Crisis Inquiry Commission has released its report. In a sign of how politicized economic analysis is in the USA, there are two Republican dissents from the main report -- it appears that in good Brendan Behan style, once the Republican commissioners had decided to split away from the main report, they then fell out among themselves. Anyway, three of them -- Keith Hennessey, Douglas Holtz-Eakin, and Bill Thomas -- have published their dissent. It proceeds with a variety of non-controversial findings and at times makes it appear as if the differences with the main report are mainly a matter of emphasis on different aspects of those findings. But at the end, it's clear that isn't simply a difference about the "causes" of the crisis. It's a difference about what was the crisis. If financial firm X is a large counterparty to other firms, X’s sudden and disorderly bankruptcy might weaken the finances of those other firms and cause them to fail. We call this the risk of contagion, when, because of a direct financial link between firms, the failure of one causes the failure of another. Financial firm X is too big to fail if policymakers fear contagion so much that they are unwilling to allow it to go bankrupt in a sudden and disorderly fashion [bold font in original]. The financial panic was triggered and then amplified by the close succession of these events, and not just by Lehman’s failure. The problem is that "these events" were the just the manifestations of a fragility that had been building up for years and had metastasized in the summer of 2007, one of those "foreshocks" that receive almost no attention in the report. September 2008 was when the shakeout peaked, but the crisis had already been in full flow for a year by that point. There was indeed a strange summer 2008 reprieve (which, incidentally, appears to have suckered governments in Ireland and Iceland into a false sense of security as well), but to pick out one month when the financial accident and emergency room was especially busy isn't going to tell you a lot about how the crisis started. Cynical addendum: the dissenting report is fixed on quarterly GDP as a measure of crisis severity, an indicator that is negative (and therefore looks bad in some vague sense) for just 9 months, 6 of them being especially awkward for George W. Bush and John McCain. Is the message that except for one month of costly meddling, things would have been fine? Rediscover your inner Irish nationalist by going to this video at the 12:20:00 mark and watching Tories and Ulster Unionists gloat -- incorrectly as it turned out --at an anachronistic situation involving the resignation of Sinn Fein MP for West Belfast, Gerry Adams. FWIW, we wonder if the DUP and the Speaker of Commons had originally agreed that Gregory Campbell should get to raise the Adams issue and segue into a question about expenses, when they realized that Campbell might have some problems on that score. So instead Campbell did an old-news question about fuel taxes, and Dodds got the Adams question. Two questions to a small party during Questions to the Prime Minister is very hard to explain otherwise. 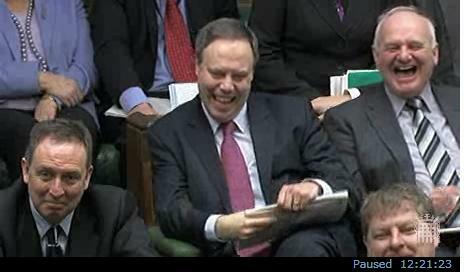 Mr Nigel Dodds (Belfast North) (DUP): The Prime Minister may be aware that one of the Members elected to this House has decided to emigrate, and he may want to chalk that up as one of his achievements. The hon. Member for Belfast West (Mr Adams) seems to be extremely embarrassed about applying for an office for profit under the Crown although he has shown no such embarrassment in profiting from his office in this House for many years at taxpayers’ expense. When will the Prime Minister deliver on his pre-election pledge to hard-pressed taxpayers that he will abolish parliamentary money for parliamentary purposes going to those who do not fulfil their parliamentary duties? The Prime Minister: First of all, just in case everyone has not caught up with the news, the right hon. Gentleman is quite right that the hon. Member for Belfast West has accepted an office of profit under the Crown, which is of course the only way to retire from this House. I am not sure that Gerry Adams will be delighted to be a Baron of the Manor of Northstead, but none the less, I am pleased that tradition has been maintained. On the very serious point that the right hon. Gentleman makes about allowances, in my view we should be aiming for all Members who are elected to take their seats in this House. That is what should happen and if some Members have a problem with what that entails, they ought to look at a remedy for that and should come and talk about it. That is the most important thing we could achieve. Photo: General William Tecumseh Sherman, 1865, via Wikimedia commons. Mediaweek‘s Anthony Crupi was also at the keynote, and reports that Roberts dodged a question from Chernin (who once counted Fox News among the divisions he oversaw) about what he would do regarding MSNBC firebrand Keith Olbermann. Just because you see that gekko add in every state doesn't mean you're buying car insurance from the same gekko. You can't buy car insurance across US state lines, as a cursory online trawl for insurance regulation will show. You have to have insurance in the state where you live. If you try living in one state with insurance from another, it's illegal. And it's a big mess when there's a crash involving cars with different state-mandated policies. In short, in the USA, insurance regulation is a matter for states, not the federal government. Yet it's the supposedly anti-federal Republicans who want to use federal law to crash, if you will, through state policies. The Republican vision for healthcare is that everyone could have New Hampshire style auto insurance for healthcare. Meaning, possibly none. Peter Robinson and Brian Cowen, nearly 3 years ago. The Taoiseach, Mr Brian Cowen TD, will today (sic) lead the Irish Government delegation at the Eleventh Plenary Meeting of the North South Ministerial Council ... The meeting will be held in the new headquarters of the Joint Secretariat to the North South Ministerial Council in Armagh and will be hosted by the North's First Minister Peter Robinson and deputy First Minister Martin McGuinness. The photo above comes from a 2008 news article where both leaders-elect were in coronation mode, and promising the island a glorious future in the booming financial services industry. Then Peter Robinson found out about his wife and the younger man, and the Republic of Ireland found out about Brian Cowen and the bankers. In the republic, we'd have been better off with the affair. But either way, as the financial deluge subsides and the waters fall short, we see the dreary leaders of Down and Offaly emerging once again. You have a gatecrasher coming on 17 March, 2011. A "Mr Brian Cowen" will appear at the White House gate on that date with a bowl of shamrock claiming that it is a traditional gift for the President. Your protocol staff should note that this gentleman will have led his political party to a crashing defeat in Ireland's general election on March 11, having failed to defer the election until March 25. Thus he will be seeking entry as caretaker prime minister of the country, with parliament not yet having reconvened to vote on a new government, but with him having hung on in that caretaker capacity since 20 January, 2011. To preserve the dignity of Ireland and the USA, he should not be let in. National Security Adviser, Chairman of Abu Dhabi Sports Council H.H. Sheikh Haza bin Zayed Al Nahyan has received Manchester United Club delegation, and representatives of Reem Investments Company, who inked a deal to expand Man United football schools for juniors in Abu Dhabi and other emirates. Wait a minute ... Abu Dhabi and Manchester United? Shouldn't it be Manchester City? Manchester City Football Club is owned 100% by His Highness Sheikh Mansour Bin Zayed Al Nahyan. Gill [Man Utd CEO] did not rule out the possibility of their first team playing in Abu Dhabi in the future although their current schedule only allows for a tour in July to prepare for the season ahead. “Abu Dhabi is an interesting footballing area. We played in Saudi Arabia three years ago. What we don’t have in England at the moment is a winter break unfortunately. Most of the Premier League clubs would like one so that there will be some training programme here. But there is nothing in the calendar at moment but we don’t rule it out in the future,” said Gill who acknowledged the importance of the region with 2022 World Cup decision. Note: he says the English clubs would like a winter break in the club season, because it would open (unsaid: potentially lucrative) tours of the Gulf. It looks getting this 2022 World Cup moved to winter may not be as hard as people fear. The Heritage Foundation Index of Economic Freedom still luvvs Ireland. Sure we're down a few places to 7 in the global ranking but for an economy that just got an IMF/European Union bailout loan, that's not bad. Credit to Heritage also for having New Zealand, Australia, and Canada ahead of Ireland and the United States. People reading Heritage Foundation commentary on the replacement of BoehnerCare by ObamaCare might have concluded that that moving towards a more socialized system of health provision was the death knell of economic freedom in the USA but apparently Anglophone countries are managing just fine with such systems. Ireland’s competitive financial system was compromised by the collapse of a property bubble in which banks were highly exposed. Government action in response to the financial crisis included the establishment of a single fully integrated regulatory institution. The government also restructured the financial sector, creating the National Asset Management Agency to stabilize banking and restore liquidity. Since early 2009, the government has nationalized Anglo Irish Bank, Irish Nationwide, and Allied Irish Bank. The Bank of Ireland has received capital injections and remains partly state-owned. 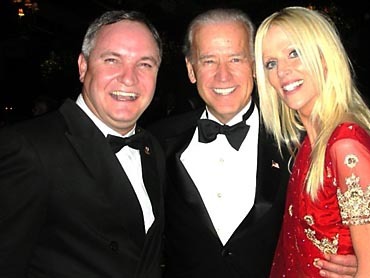 70—Limited government influence. Credit allocation is influenced by the government, and private allocation of credit faces almost no restrictions. Government ownership of financial institutions is sizeable. Foreign financial institutions are subject to few restrictions. "Limited Government Influence" of a sector that is in slow-motion nationalization by the government and indeed a sector that would have not survived in its current form without massive government support? Note for instance that fellow Eurozone member Italy gets a lower score, a 60, "significant government influence". If you were a private investor, would you put your money into an Irish or Italian bank? The attempted assassination of US House Rep. Gabrielle Giffords and the murder of 6 people in the group is a depressing topic about which there doesn't seem to be much useful to say, beyond what Gail Collins says about the inexplicable fixation of the gun lobby of ensuring easy access to semi-automatic weapons (as opposed to plain old single round pistols). But in the particularly idiotic talking points revolving around the relative significance of Mein Kampf and The Communist Manifesto in Jared Loughner's reading list, it's strange that there's not more attention on the presence in that list of The Wizard of Oz, since it may confirm his obsession with the foundations of currency. Hillary and Bill Clinton meet Saudi King Abdullah recuperating from surgery at an apartment in New York City. David Ebersman, Facebook’s chief financial officer ... On his Facebook page, Ebersman says he was a member of the Class of 1991 at Brown University in Providence, Rhode Island. He lists Ayn Rand’s “Atlas Shrugged” and “The Fountainhead” as two of his favorite books.